Option for Merging of GPDP Works captured through Plan Plus portal into NREGASoft is available at GP/ PO login. Data entry for FY 2018-19 will be closed on 15th April 2019. All the States/UTs are requested to kindly update the CBS Postal account number against the Non-CBS postal accounts of workers using the option 'Verify/Freeze CBS postal account' provided at GP/PO login. Please refer 'State/District/PO login user' manual uploaded under 'NREGASoft updates' link. 'Janmanrega' - Mirror of MGNREGA. 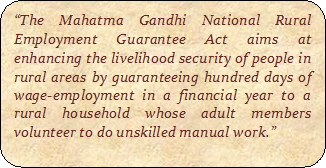 Get all the information about MGNREGA and its works. For more details, download app (Beta Version). Joint letter of MoRD & DFS dt. 18th July 2017 on Aadhaar camps- SOP – Regarding. User Manual for Capacity Building for Digital Payments. For MIS issue email at nicdrd[at]nic[dot]in. Site designed and developed by National Informatics Center Contents provided and maintained by Department of Rural Development, Ministry of Rural Development, GOI.